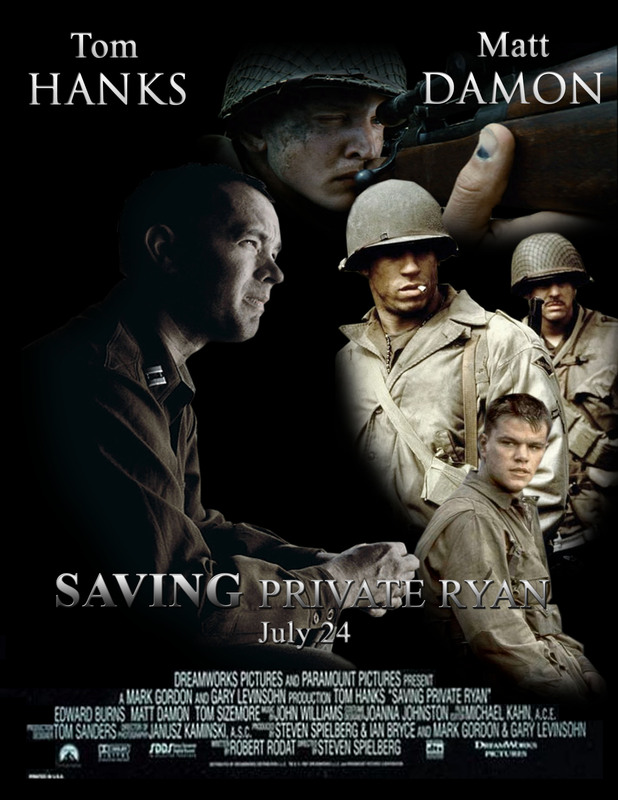 AFI Top 100 Movies #3: Saving Private Ryan, Earning It! I was really excited about watching this movie because I heard about it a lot and a few of my guy friends had told me it was their favorite movie. One of them even told me that this movie was the only to make him cry. I’m really into emotional movies that make me cry because that means that the message and the acting is so powerful that it sparks up an emotion in me, plus I saw that the movie had Tom Hanks in it and that moved me to watch the movie as well. So far out of all the movies I have written about, Saving Private Ryan has been the best by far! I really liked this movie and was hooked from the very beginning. Let me tell you guys a little bit about myself, I’m really into action. You throw action into a movie and I’ll have my eyes glued to the screen no problem. 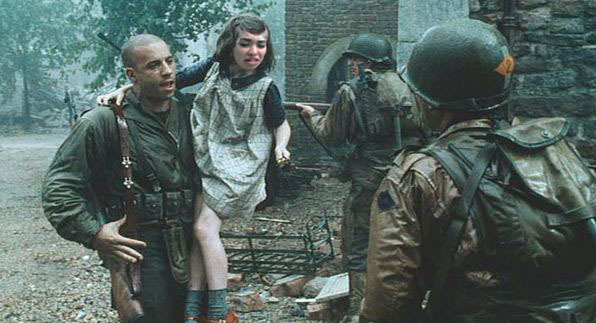 Saving Private Ryan was packed full of action. One of the first scenes from the movie is them fighting on the beach and everyone was getting killed. Blood and guts rained over the soldiers as they fought for their lives and their country. It was a very gory movie seeing how soldiers were being blown up into pieces, limbs were being torn off their bodies, and blood was everywhere. Another thing you guys should know about me, I’m not very good with blood. Even if it’s in a movie, I see a lot of blood and I feel sick to my stomach. I know I’m weird, I like action movies but get sick at the sight of blood. Something I found interesting was that while the soldiers were getting shot at, there were medics on the battlefield trying not to get hit by bullets and perform surgery at the same time. Talk about high stress levels! I know I wouldn’t be focused enough to try and get a bullet out of another man, I’d be running around like a headless chicken and praying I don’t get shot. I’ve complained about the other movies having cheesy effects but the effects in this movie were on point and fantastic! Everything looked so realistic which didn’t help with my blood situation but still cool. Seeing this movie has helped open my eyes to see the kind of risks that our soldiers put themselves in every day trying to protect us and our country. I really salute you all that are currently fighting or have fought in a war. You guys are true heroes and I appreciate everything you do. Something that connects all three movies is that they all mention World War II in them. Citizen Kane talked about the Germans and soldiers, Casablanca was a place that rich french people went to during the war. While watching the movie I have noticed a lot of themes in the movie which I found very touching. In the movie one of the men that were on the mission went to go try and save this little girl even though his captain said to leave her. The soldier felt like he could help the little girl but instead he got shot. So I started thinking, can someone afford to keep their humanity on high risk situations like this or should they stick to their mission? I feel like this showed that once you go into war your main focus is to try and get rid of the enemy and protect your country so everything else that would seem right is not done because they have to stick to their specific mission. Something else I found interesting is how this movie portrayed the saying “one for all and all for one”. Basically the whole movie is these 8 soldiers risking their own lives to send private Ryan back to his mother because his other three brothers had died int he war and they could not put Mrs. Ryan through another heartbreak of losing four sons. All of the 8 soldiers stuck by each other and protected each other from harm as best they could and went to go save another one of their fellow soldiers. This shows how in the army you can form such a tight bond with each other that it becomes a brotherhood. One of the saddest parts in the movie to me was when they went to go tell mama Ryan that three of her sons had died. This took place in World War II so they didn’t get a phone call, they would have a vehicle drive up to your house and someone would tell you. They showed an army green car pulling up the drive way and mama Ryan looking out the window at the car so you could tell that she knew one of her sons had died but she was praying that it wasn’t true. The worst part is that the audience knows she lost all three of her sons but she doesn’t so I’m waiting there crawled up in a ball imagining how difficult it must be to know that three of your sons died and you still have another one fighting in that war. Now I’m about to rant a little here about this soldier, Upham. He was taken on the mission because they needed someone who could speak German to go along with them. I liked him at first because he kept the soldiers in the group sane and tried to restore balance and good in them. The soldiers were going to kill a German soldier because he shot and killed one of their friends but Upham spoke some sense into them and they ended up releasing him. Later in the movie that same German soldier comes back and is fighting another one of his fellow soldiers and Upham knows. But what does he do? He is so scared that fear paralyzes him, hides behind the stairs and listens to a friend of his get killed by someone he gave a chance to live. Don’t just sit there and listen to your friend get beat up! Try and help the poor guy! I know that Upham was afraid of killing people but instead of killing the guy you could shoot him in the leg or the arm so that he stops beating up your friend. The worst part is that after the German soldier killed his friend he just watches the German soldier go down the stairs and back into battle. He then sits on the stairs and cries some more. Life as he knew it changed forever as he ends up killing that same German that he saved in the beginning towards the end of the movie. His decision to save that German ended up costing the lifes of many of his fellow soldiers. I’m going to leave you with a question that I don’t have an answer to: Do you think it is possible to keep your humanity during times of war? Can you afford to keep your humanity during times of war? There really wasn’t any fashion to look at in this movie since they were concentrating more on the action and the soldiers that were fighting. I think this movie was a great movie for people to watch because it opens your eyes to look at it a little more from a soldier’s perspective. So now I think about how people complain about how much they hate their jobs but soldiers are risking their lives fighting for a majority of people they don’t even know but they still sign up. I am so grateful for the life I am given and to know that these soldiers help me live it and keep me and the rest of the country safe.